The Brainac™ Refiner Control System is designed as a complete solution to fit your refiner control needs. Used as a stand-alone system, or integrated into any existing DCS platform via standard protocol communication links, the Brainac™ Refiner Control System will optimize your refiner controls through controlling: specific energy, freeness, and overall power consumption, allowing papermakers to consistently maximize their furnish quality, minimizing web breaks, and lowering their overall refining energy consumption. Safety is a critical issue for refining controls. The Brainac™ Refiner Control System is equipped with redundant power supplies for complete reliability. The high speed interlock logic and controlling relays are powered by these redundant power supplies to assure that the refiner is protected from any plate damage. Automatic unload alarm limits, along with continuous Measurement Validity Checks (MVC) on external devices complete the safety package. 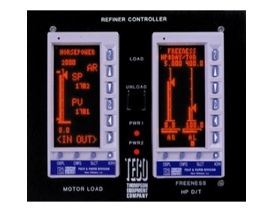 Continuous control of the refiner based on freeness, consistency, flow, and power measurements. Specific Energy Control - providing uniform refining during production rate changes or changes in consistency. Freeness Control - minimizing web breaks, optimizing energy consumption, and maximizing overall quality. Redundant Power Supply - for complete reliability. High Speed Interlocking Logic - maximizing refiner plate protection. Measurement Validity Check (MVC) - ensures control adjustments are only made on sound data. Digital Communication - easily integrates into any DCS platform.